For the past eight years we have been working on the Yamuna remediation project with some cooperation, but no resources or financial support, from the Government of Delhi. We have prepared preliminary designs and plans for a wetland treatment system demonstration project back in April 1993, and submitted that to the Delhi Water Board. No action has yet been taken by them. However, our attempts have surely made some impacts in terms of awareness and drive amongst local citizens. The 13.8 million people of greater Delhi generate over 650 million gallons of wastewater per day, which flows, mostly untreated, into the Yamuna river through 17 major drains. Our continued effort with the support of local associations, such as, the Lions Club Delhi Capital, has resulted into two major decisions by the Supreme Court (April 2001) mandating the Delhi Government to (i) stop further discharge of untreated sewage/wastewater into the Yamuna river and (ii) cleanup the Yamuna river by March 31, 2003. Although we can not discern the implications of such mandates, the focus of the Yamuna cleanup effort surely got a much better momentum by such promulgation. We were invited by a group of people from Agra to visit the Yamuna sites there and to grasp a general view of the extent of pollution in the river. 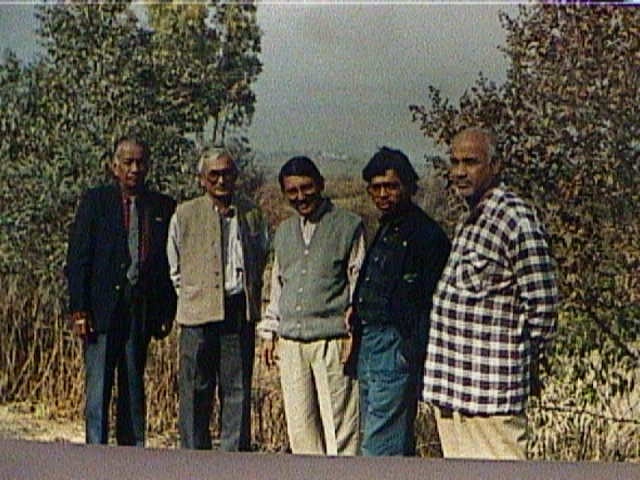 We accommodated the request and arranged for a visit on December 16, 2000 along with a team of volunteers (Mr. Brij Khandelwal, Mr. Vinay Paliwal, Mr. Shravan Kumar, Mr. Surendra Sharma, Mr. Raman, and Mr. D.K. Mital) from Delhi and Agra. The team first visited Sur Sarovar, a vast (1766 acres) wetland Northeast of Mathura, where water hyacinths were observed to have taken over the wetland limiting the entry of sunlight causing serious anaerobic condition at the bottom and thus impeding effective sequestration of contaminants. This vast wetland can be rejuvenated to a very effective cleanup system. We are discussing with various entities to look into that option and a short proposal is being written up for funding a detail study by a technical team from here. We visited the Gau Ghat area, South of Mathura next, and noticed floating oil globules in the Yamuna water. We took two samples - brought one to US and given the other to the Central Pollution Control Board, New Delhi, for their analysis. The Yamuna water sample from the Agra (Gau Ghat) area was analyzed by the EPA certified laboratory, STL Baltimore using the EPA method 418.1. The analysis report is over 25 pages and includes a complete QA/QC (Quality Assurance/Quality Control) and many other information. Because of the impromptu sampling, the quantity and the containers were not the best that could be used for analyzing the Total Petroleum Hydrocarbon (TPH) by the Laboratory. The result showed TPH at less than 19,000 ppb or 19 mg/l. According to the Lab Manager the TPH content could be many times higher, if we had one litre of sample instead of 50 CC. So, easily a factor of 20 could be added here, plus the oil sheen on the inside of the plastic bottle was visible, but could not be rinsed with Freon, because plastic would melt with Freon. In standard procedure, a glass sampling jar is used, and the inside wall is rinsed with Freon to recover the hydrocarbon film . So, the conclusion that could be drawn from this sampling event, supported by analysis, visual records, and pictures, is that the petroleum hydrocarbon is getting into the Yamuna river somewhere between the Sur Sarobar (where the water did not have any floating globules) and Gau Ghat. It could possibly be leaching into the river bed through perched groundwater, since the globules were predominant only on the central flow area of the river and not along the bank. The above report was sent to Agra and it made headlines in the local newspapers there. Investigations and interviews were undertaken by the Blue Yamuna team members, but without a strong support from the local Government they are still stagnating to come up with a complete and methodical investigation to identify the source and to initiate a remedy. In January 2001 our engineers and field assistants in India visited the Agra area and conducted a detail feasibility study of four different sites. The sites are shown below. A few Deep Pond System to treat 1,500,000 gallons of raw sewage (i.e 1.5 MGD) by each one of the Deep Pond Systems. we took an active step to help the victims. The quake affected area along with the camp area of the Yamuna team is shown above. "...returned from Kutch (Gandhidham) and Bhachau after 52hrs. The emotional trauma of the survivors of the Gujarat Earthquake may be harder to deal with than needs such as food and shelter. While so many other aspects of relief and rehabilitation are moving forward, we can't afford to overlook the great need for emotional support that still exsists. I have reached Gandhidham on feb.16 at 10.30 A.M. by Kutch exp.from Mumbai central. Hired a autorikshaw and visited many places of quake effected area for six hours only in Gandhidham covering 20 sq.km and taken few pictures.I know the amount of releif being sent from Yamuna foundation to me for distribution may be a drop in the ocean of required relief for such a disaster in GujaratI have tried in many relief centre to donate the materials I carried with me, but, they were busy offering lunch in the camp. Entry was restricted . I was allowed to give only in one camp in Dushera Maidan(old court) in Gandhidham which is 2 km.from NH-8A. I have given Chashew nuts, nestle everyday (powdered milk), Real pineapple juice/orange juice, Cadburys dairy milk/Nestle kitkat, and phenyl as a disinfectant liquid..."
Further donations were also made through the Rotary club, Swamy nathan Temple(Dadar), Kutch yavak sangh etc. Following the visit to the area, Tents and Tarpaulines have been shipped by the Blue Yamuna team through the Rotary Club of Mumbai. 1. Your thoughts, wishes, and acts towards cleaning up the Yamuna river will go a long way in supporting the goal of the Yamuna cleanup effort. 2. I'd like each of you to take one simple step towards preventing pollution from going into the Yamuna River. This may include forming a subcommittee in your neighborhood and ensure pollution-free discharges into the drain in your area. 3. Through active coordination and interaction you can jointly develop an action agenda and present that to the authorities and help them to start implementing that agenda in a step by step process. 4. You should focus your attention on the Yamuna cleanup effort by first identifying all of the feeder drains that pollute the river Yamuna and then pursue the most beneficial and practicable option for prioritizing the cleanup. Remember that clean discharges from these drains will lead to a clean and blue Yamuna one day. 6. Providing us with any existing reports or literature about the pollution in the Barak river. The villagers there have no access to a medical facility. Many children fall victims of diseases, maltreatment, and no treatment ending their lives even before they reach adulthood. We noticed this problem a few years ago. Due to flooding in the neighboring rivers, canals, and nearby Shon Bill, one of the largest wetland in the area, the villagers face serious problems and often get cut off from the outside world with inaccessible roads. As a first step to provide help to the villagers, we have initiated a small project to build a charitable dispensary with the help of Dr. K.K. Das from Binghamton, NY, who has been working out of the Red Cross Hospital in Silchar, India for the past ten years or so. Dr. K.K. Das is making arrangements for placing paramedics and necessary operational arrangements to run this charitable dispensary. This dispensary is expected to bring new hopes to these children, and a feeling of great comfort and support to the villagers. 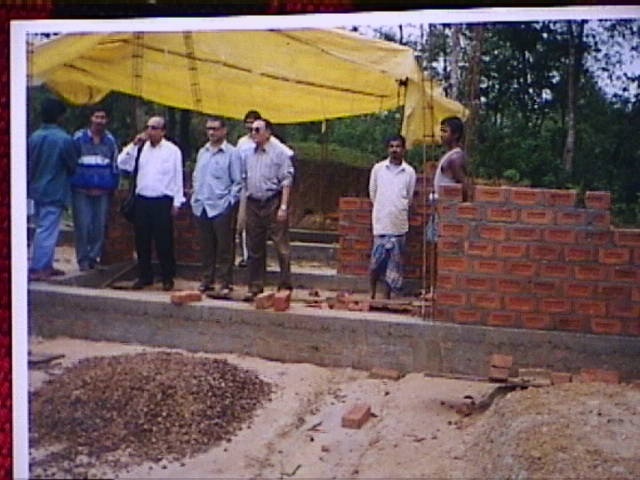 The Yamuna foundation has started construction of the building and hopes to complete that soon with help from the patrons. The next step for the foundation is to look into the serious hydrological problem in the area which causes frequent flooding of the farm lands and thereby destroys the crops and transmits diseases to the villagers. We will also be identifying the sources of pollution that are possibly invading the water bodies of this pristine environment.